Monday – Saturday, 11 a.m. 'til 6 p.m.
Sunday, 11 a.m. 'til 5 p.m. Carve out time to relax and rejuvenate with our offerings, which range from facials and massage to manicures and haircuts for women and men. Scroll down for the complete list. We welcome walk-ins, but appointment reservations are recommended. Our outdoor heated soaking pool is an oasis surrounded by natural rock formations and lush green flora. Spa guests receive complimentary access to the pool. Minors are welcome if accompanied by an adult. Note: We recommend that you use the soaking pool prior to any spa appointment to avoid rinsing away skin care products after your treatment. 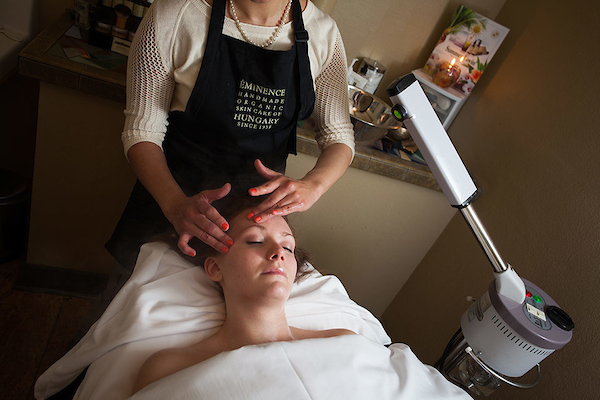 Let Mother Nature help cleanse and refine your complexion with healing, antibacterial elements such as Hungarian mud, clays and more, custom blended for those with acne-prone or reactive skin. Our licensed estheticians will give you suggestions on specially designed products and instructions to further treat your skin at home. This anti-aging treatment addresses your skin's loss of elasticity due to the natural aging process as well as environmental damages. Loaded with potent organic vitamins and rich plant greens, your skin will be lifted, toned and rebalanced. You'll feel revitalized, radiant and perhaps even years younger! Please note: This treatment is performed as part of a series; a consultation is necessary prior to the service. We'll refine the tender skin on your back using natural products specific to your skin concerns. A healing blend of fresh fruits and vegetables will be used to cleanse and exfoliate your skin, while treating breakouts at the source. Finally, enjoy the luscious scent of a whipped moisturizer that will keep your skin hydrated and clear. We'll exfoliate, hydrate and plump your lips using natural peptides and hawthorn berries that aid in building collagen and filling in fine lines. See instant results with Eminence’s Ultra Lift Advanced Age Corrective products. Targeted products including eye cream, line filler, and neck cream are the perfect add on to the rejuvenating facial. Enjoy a 10% discount on any massage or facial when added to a body treatment; this service must be reserved in advance. Natural, seasonal ingredients are used to scrub, wrap and soothe your entire body from head to toe. Choose your own scents and aromas from a menu of products that change with the season, ensuring the freshest ingredients available. Done a bit too much celebrating lately? In this treatment, we'll use natural products to scrub and wrap your body while the toxins leave your skin. Then, after the product removal, your skin will be soothed with a calming finishing lotion. This treatment begins with a coarse sugar scrub for exfoliation, and soothing warm towels. After removing the scrub, a body butter is applied to fully moisturize the skin. Luxurious oils are used with gentle massage techniques to assist with stress relief and muscle aches. Warm basalt stones and rich oils release tension along the spine, shoulders, legs and back to rebalance and renew your energy. This massage will take you to a dream state of relaxation using custom-blended oils. Soothing massage strokes will leave you thoroughly rejuvenated. Tension bound deep within your muscles is released with this effective treatment. Organic oils and massage provide intensive therapy for muscles, joints and ligaments. Ideal for the expectant mother in her second or third trimester, this massage offers gentle relief from the natural tension and demands of pregnancy, while restorative oils soothe overworked skin. Soothing relief for tired hands and forearms; our therapists will use focused massage techniques to work out the kinks in your muscles. As an added benefit, they’ll work in a sugar scrub and paraffin wax to leave your skin soft and moisturized. 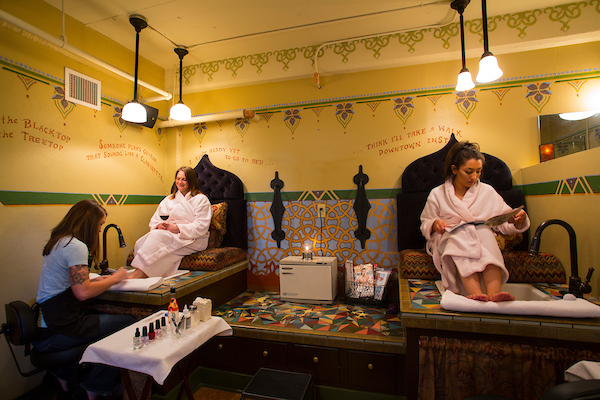 Customize your own manicure and pedicure using products chosen from a changing seasonal menu. Nails are filed and smoothed, cuticles tidied and skin exfoliated, softened and massaged. Finally, a warm mitten or boot wrap deeply conditions your skin. Finish with a nail buff or polish of your choice. In a bit of a hurry? Then enjoy the benefits of our express nail services that use seasonal products from a changing menu. Nails are trimmed, cuticles are tidied and your skin is lightly massaged. Finish with a nail buff or polish of your choice. 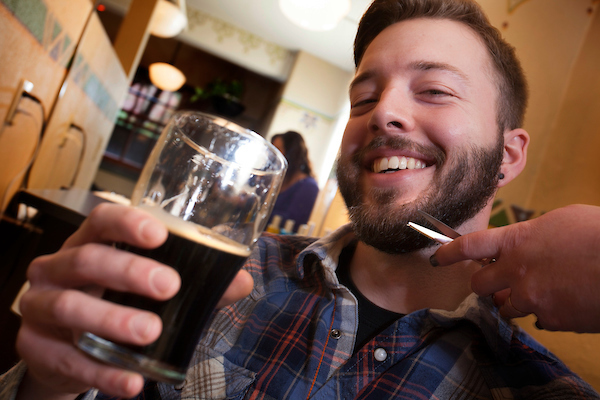 A great way to enjoy our most popular services. Start off with an hour-long Ruby's Spa Massage. Next, enjoy an hour-long Ruby's Spa Facial and a 45-minute Ruby's Express Pedicure. Enjoy a lavish 90-minute massage, 60-minute facial, and to top it off, a Grand Lodge Manicure and Pedicure. Need some serious pampering and luxury? Begin with an hour-long body treatment (Seasonal Body Works or Detoxification), followed by another hour of a Ruby's Spa Massage. Next, enjoy a lavish 90-minute Sun & Moon Facial, along with the Bright Eyes and Full-fill Lip treatments. Includes lodging for two in the hotel in a queen European-style room, two 60-minute spa treatments (choose from below), along with breakfast the next morning. Please call the hotel for reservations. Cleansing, exfoliation, extractions, Hungarian Herbal mud treatment and a deep facial massage finished with a neck and shoulder massage. Customize your pedicure using products chosen from a changing seasonal menu. Nails are led and smoothed, cuticles tidied and skin exfoliated, softened and massaged. Then a warm boot wrap deep conditions your skin. Finish with a nail buff. Your nails will be led and shaped, removing rough edges and cuticles.